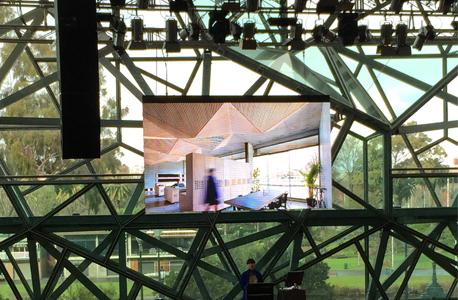 Above image: The first talk of the Congress is made by local artist and Assemble Papers editor Eugenia Lim on the interdisciplinary topic of ‘who is my neighbour’, held at Deakin’s Edge. Article and images by Amelyn Ng. The Congress had a way of rounding up each group of talks with a Q&A panel, to summarise topics as well as prompt vital commentary from what had just been digested. These back-and-forth moments of shared perspectives left the greatest impression on me – perhaps it was the intriguing balance between input and output, between student and speaker. It was refreshing to see so many unsolicited questions put to the presenting professionals – and from a broad cross-section of the student audience, not a recurring few. Having experienced my fair share of painfully forced post-lecture Q&A sessions, I was quietly proud of the delegates for being so vocal and genuinely inquisitive. These students were unafraid to ask the contentious questions, and to flag any unclear aspects of the work presented by established senior academics (who, to their credit, rose to the occasion and responded with a matching grace, wisdom and honesty where they could not provide a definitive answer). Take Sean Godsell’s lecture for example. After Sean’s rather heartfelt and deeply serious oration about his work, childhood and paternal relations, a delegate from Helsinki raised her hand and asked, with a brazen yet genuine innocence only a student could pull off: “If you could present a project to your father, which would it be?” Sean was momentarily taken aback – a rare moment for those who have heard him present before. But like most quick-thinking architects, he quickly recovered, and with a joke managed to dodge the bullet. Another anecdote: after the final lecture by Takaharu Tezuka, one student enquired about the absence of process and iteration in his form-finding. How could the single timber model, one that persuaded the authorities into unanimously approving the scheme, not have undergone rigorous development? Without skipping a beat, Takaharu replied with a little laugh and a wise smile that he had actually made 2000 models for the project (for which he had an exhibition in Tokyo), from which he selected and presented the best one. Needless to say, the entire student body was amazed. He then advised everyone that if you, too, made a hundred models for your first presentation, you might also find the same favour with your jurors. 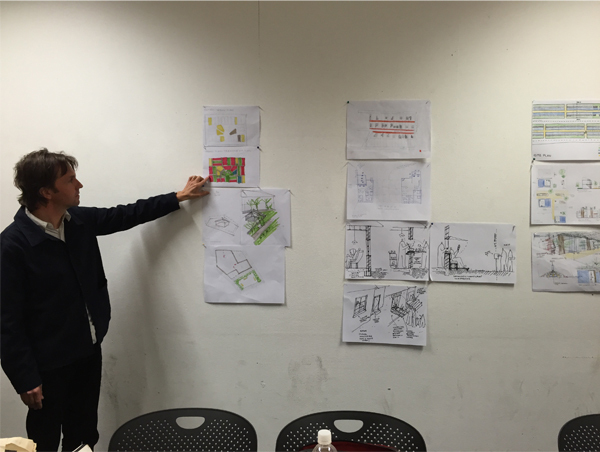 Architect Nigel Bertram of NMBW gives insightful feedback on student work during Day 2’s workshop session. On the second day, students dispersed across a variety of local architecture offices in inner-city Melbourne for a 3-hour design workshop. Everyone worked to a common hypothetical (yet nonetheless pertinent) brief of accommodating an influx of 10,000 refugees into the city of Melbourne. I had the privilege of attending Nigel Bertram’s studio at RMIT Building 45 in Carlton, for which his practice NMBW had done the fit-out. While I looked forward to meeting the prolific architect-educator-writer in person, I had not yet given thought to what could be gleaned from the other attending delegates. As such I was happily surprised by the degree of passion and quick thinking these mostly undergraduate-level students possessed. After a brief discussion led by Nigel, ideas about the re-use of state housing stock were quickly developed in small groups and presented in rapid succession through collaborative brainstorming and pin-ups. Ironically, I was not just the sole graduate in the group, but the only participant from Melbourne. The group comprised interstate students from the University of Adelaide, and a large group of New Zealanders from Victoria University, who travelled together from Wellington to Melbourne for the conference, all of whom engaged head-on with a topic as one of urgent design intervention – not just in this city, but as a reflection of state housing and migration in their own cities. How could the collective synergies and enthusiasm of a short workshop such as this be channelled back into the semester-long design studios at our universities? How could tertiary design education benefit from the ’super-studio’ model, known for intense productivity and uninhibited peer-to-peer contributions. All in all, this year’s People Congress was far more than just a literal formation of people, but a high-collision assembly of students rallied together in the same spirit of progress, guided by the generous support of mentors and teachers. It was emblematic of what the profession should and could look like. The ‘call-to-arms’ nature of this Congress has surely instilled in every delegate a renewed sense of purpose and possibility in any direction he or she so chooses; that being young or under-experienced should not preclude students and graduates from making a difference or becoming voices of influence in the field. That the design industry is not as intimidating nor impenetrable as it might have once seemed to the emerging entrepreneur or work-experience seeker. That there will be big shoes to fill when the time comes to build upon what other ‘Gen X’ practitioners have established and left for us, the next generation. That in order to move forward, everyone involved with must not be self-focused, but outward-reaching. This may mean diversifying the available modes of practice, creating common goals instead of corporate rivalry, jointly responding to human and ecological crises, and ultimately stewarding the liveability of our society and our cities. As the final night wrapped up with good cheer, newfound friends and free SONA merchandise, I glanced across the bustling auditorium and thought to myself: if these motivated students went out into the world and really made something of the lessons learnt and ideas shared here at this Congress, then the future of architecture- both in discourse and in practice- could well and truly be in good hands. Amelyn is a Melbourne-based researcher-designer of architecture and urbanism, with a particular interest in critical practice and consumer behaviours in architecture. She has worked at a variety of practices such as John Wardle Architects, JCBA and Fieldwork Projects (current), across a diverse range of project scales – from masterplanning and institutional buildings to apartments and single residences.